We're not always aware of how and when the Spirit of God will work. That's one of the reasons why I entitled my recent book on Spiritual Gifts Unfettered Spirit. The Spirit moves where and when the Spirit desires. We can get on board, but we can't control the Spirit. 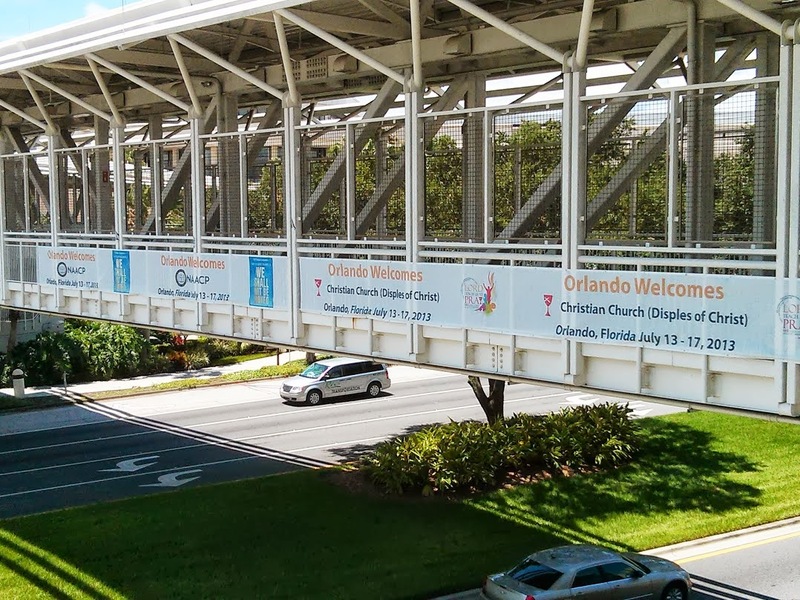 Looking back at the week just transpired, as the Christian Church (Disciples of Christ) gathered in Orlando for its biennial General Assembly. 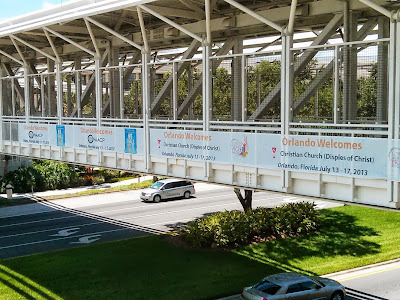 If you follow social media, you may discover that there are complaints about the Assembly -- why it costs so much and why we went to Orlando, etc. I have my suggestions for improvements next time, but this isn't the time or place to air them. What I want to suggest here is that our gathering at the Orange County Convention Center in Orlando may have been the work of the Spirit. Why? Well, take a look at the picture above. What do you see? It's a sign on the sky-bridge connecting one of the hotels with the convention center. The Convention Center is huge -- we did a lot of walking. But the largeness of this venue made it possible for us to meet in the same space as the NAACP. During a week when a jury in nearby Samford, Florida delivered a not guilty verdict in the George Zimmerman trial, we were gathering as neighbors with one of the leading Civil Rights organizations in the country. We shared convention space and hotels and restaurants. Several times a day I walked through the area where the NAACP was gathering to get to my hotel room. This reality stood as a regular reminder of the call of good to do just and to love mercy, even as I try to walk humbly with my God. The NAACP is not a religious organization, but because religion plays an important role in the African American community, I know that issues of faith in God were on the minds of their delegates. Sometimes we live in neighborhoods where people rarely interact with each other. I expect that many attendees of both conventions failed to interact. But I know that there were opportunities taken by attendees to interact. I count it fortunate to have had a couple of those brief interactions, which I hope were received as signs of true neighborliness. With the George Zimmerman verdict and the recent SCOTUS decision on Voting Rights on our minds, representatives of the Christian Church had opportunity to share in the NAACP convention, and our General Minister and President the Rev. Sharon Watkins had opportunity to address the NAACP. In return, representatives of the NAACP -- Rabbi David Saperstein and Rev. William Barber (himself a Disciples pastor) -- addressed the Assembly (Tuesday evening). Rev. Barber, who serves as the head of the NAACP in North Carolina, told us that Sharon's presence and words to the NAACP were like a movement of the Spirit -- a Pentecost moment. In both cases (I didn't hear Sharon speak, but I trust this is true), leaders from these two different communities voiced their solidarity in the pursuit of justice. If you attended the General Assembly -- did you experience our proximity to each other as an act of the Spirit? Did you experience it as a sign of God's blessings upon us? Did you hear in the conversations a call to love one's neighbor, even if that neighbor looks a lot different from you? Yes, the Spirit of God is unfettered, and if we're willing to let the Spirit lead, God will enable us to pursue justice for all our neighbors.